The key proteins involved in causing dengue are seven major proteins, which are considered as major therapeutic targets for dengue drug development. Recent studies have reported positively for NS1 protein in dysregulation of causing dengue process in humans. Dragon fruit seed phytochemicals are reported to have antioxidant and antiviral properties. In the present study we studied binding efficiency of 11 compounds that are present in the dragon fruit seeds with NS1 Protein through Insilico methods. By our virtual screening and docking result, we found that the Compound A, Compound B and Compound C have highest binding affinity with the NS1 Protein and also we predicted the binding site amino acid residues and the nature of hydrogen bonding. However more invivo experimental validation of our results with animal models will enlighten the development of more potent drugs from these compounds for treatment of dengue. Dragon fruit belongs to the cactaceae family and holds the generic name Hylocereus. It is also called as Pitaya in some parts of the world and “Buah Naga” in Malay (Choo et al., 2016). It is a native of Mexico and is now being cultivated which is now being cultivated in other parts of the world. Based on the colour of the peel and the pulp, three varieties of dragon fruit are available; Hylocereus undatus which has red peel and white pulp; Hylocereuspolyrhizus which has red peel and red pulp; and Hylocereusmeghalanthuswhich has yellow peel with white pulp (Luo et al., 2014). The fruit is oval to oblong in shape containing small, black seeds interspersed in the pulp which are edible (Mejía et al., 2013). Recently, this fruit has proven to contain antioxidant and anti-microbial properties (Nurliyana et al., 2010). These fruits have also been found to be effective in the treatment of many infectious diseases (Mello et al., 2014). The studies on the fruit seeds reported to contain high amount of compounds such as linolenic acid, Octadecanoic acid, S-(-)-1,2,4-butanetriol, n-hexadecanoic acid, 2-acetate Propanoic acid, Tetradecanoic acid, Nonanoic acid, 9,12,15-octadecatrienoic acid, Methyl-8,11,14-heptadecatrienoate, 9,17-octadecadienal, Phytol, 9,12,15-octadecatrienoic acid, Methyl ester, 7,10,13-hexadecatrienoic acid, 2-chloroethyl linoleate, 8-hexadecyne, 9,12-octadecadienoic acid, Cis-7-dodecen-1-yl acetate and Methyl-8,11,14-heptadecatrienoate (Ariffin et al., 2009). These compounds have various biological activities such as anti-eczemic, anti-microbial, anti-depressant, anti-malarial, anti-filariasis, anti-histamic, anti-cancerous, anti-inflammatory, anti-arthritic, anti-asthamatic, and are also effective in the treatment of neurodegenerative diseases and also hypocholestremic (Sushmitha et al., 2018). Since Hylocereus undatus fruit has been reported to show its effect against dengue, this study was done to find out the computational binding affinity of the compounds present in the Hylocereus undatus seeds with the dengue virus protein, the NS1protein. The 11 compounds used for the docking analysis were 7,10,13-hexadecatrienoic acid, 9,12,15-octadecatrienoic acid, 9,12-octadecadienoic acid, 9,17-octadecadienal, methyl-8,11,14-heptadecatrienoate, n-hexadecanoic acid, nonanoic acid, octadecanoic acid, phytol, S-(-)-1,2,4-butanetriol and tetradecanoic acid. Dengue virus is present in four serotypes which are DENV-1, DENV-2, DENV-3 and DENV-4 (Malavige et al., 2004). Dengue viruses are made up of three structural proteins and seven non-structural proteins (Perera and Kuhn, 2008). NS1 protein belongs to the non-structural protein of the virus. NS1, unlike other proteins do not form the part of the virion but they are found to be expressed on the infected cells. This protein is involved in viral replication (Malavige et al., 2004). NS1 is a secretory and membrane-associated glycoprotein which also has it function in immune evasion. It is hexameric and barrel-shaped protein. The protein utilized for the study was the study was from the Dengue virus type-1 [strain Nauru/West Pac/1974] (Edeling et al., 2014). Bioinformatics is a branch of science, which uses mathematics, statistics and computer to analyse the biological data. Bioinformatics is now used widely for the research purposes (Mehmood et al., 2014). Protein Data Bank (PDB) serves as a bioinformatic tool and contains has large number of ligands, proteins and other macromolecules (Berman et al., 2000). Interaction of the ligand with the protein is important to develop the drugs in a pharmaceutical basis. 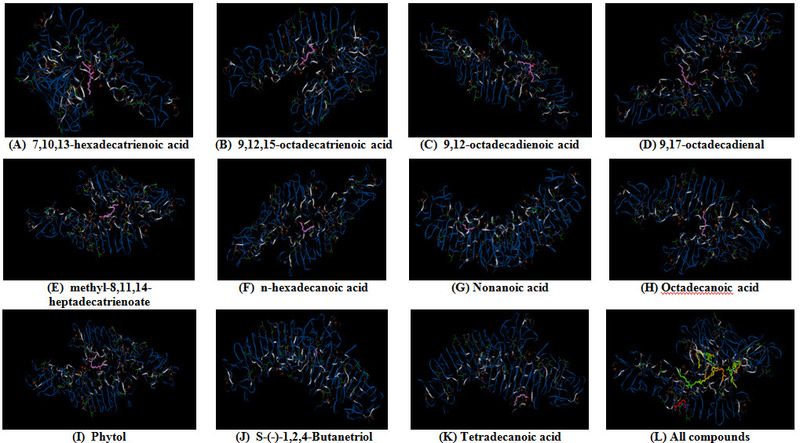 Docking analysis gives the interaction profile of the ligand with the particular protein. This interaction serves as a basis for the pharmaceutical drug production (Ferreira et al., 2015). 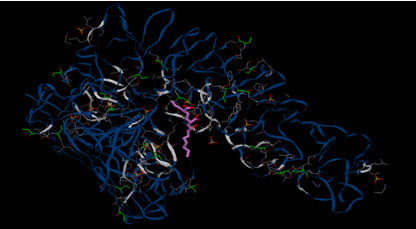 The protein data bank (PDB) was used to obtain the three-dimensional structure of the macromolecule. PDB contains large number of proteins which are experimentally determined and stored in this site. The structures are downloaded and saved either in mm CIF or pdb format. Dengue Virus NS1 Protein was used for this study. The 3D structure of this protein was downloaded from PDB and saved in pdb format. The downloaded protein was viewed in Py-Mol viewer. Ligands selected were from the previous studies on this fruit seeds. 11 ligands were used for the study. Ligands were constructed using ChemSketch (Al-Khaboori et al., 2015). The constructed ligands were optimized to add the hydrogen bonds and the obtained structures were saved in mol for docking analysis. Docking studies were conducting using iGEMDOCK software. iGEMDOCK (Generic Evolutionary Method for molecular DOCKing) is a graphical-automatic drug design system for docking, screening and post-analysis . The protein and the ligands were loaded and the out path was set. Standard docking parameters were used for docking (population size=200, generations=70 and no.of solutions=2). The docking process was initiated. After the docking process, the best docking pose for the individual ligands can be obtained. The best binding pose, the binding affinity and the total binding energy values were saved in the output folder. The saved files were visualized in Py-Mol viewer. From the Table – 1, the 3D structure coordinates of envelope protein is optimized and 11 compounds from dragon fruits seeds are identified. Their total binding energy was calculated using iGEMDOCK. Evaluation of binding conformation of 11 compounds with dengue virus NS1 protein is performed using iGEMDOCK. 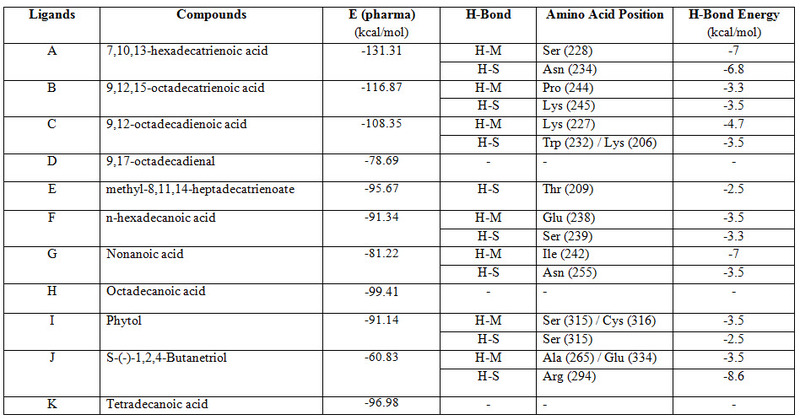 From docking study, we listed binding affinity of 11 compounds based on ligand binding energy (Table.1). The binding pose for each ligand molecule into the dengue virus NS1 protein is analyzed and the one having lowest ligand binding energy with envelope protein among the different poses are generated. The lower energy scores represent better target protein-ligand binding affinity compared to higher energy score. Among the 11 analogs, compound A, B and C are found to have lower ligand binding energy value than other analogs. Compound “A” has least binding energy score with dengue virus NS1 protein (binding energy value = -131.31 kcal/mol), compound “B” has ligand binding energy value of -116.87 kcal/mol and compound “C” has ligand binding energy value of -108.35 kcal/mol. We further analyzed the docked pose for finding the binding mode of compound “A”, compound “B” and compound “C” in to NS1 protein to validate the reasonable binding conformations. From Table – 2 and Figure – 1, the docking simulation of compound - A is performed for NS1 protein. From the docking study, we observed that compound – A has best binding affinity with the target NS1 protein. Interaction analysis of binding mode of compound –A in envelope protein reveals that it forms two hydrogen bonds with low energy, one with branched chain residue Ser 228 having -7.0 kcal/mol as its bond energy and other hydrogen bond was observed with the branched chain residue of Asn 234 with -6.8 kcal/mol as bond energy. A close-up view of binding mode of compound – A with NS1 protein is shown in Fig.2.